Two Little Cheers: Happy Halloween! I can't believe that it is Halloween already. The kids are super excited about trick or treating tonight. I am trying to get them both to take long naps this afternoon so we can stay up late tonight and eat tons of candy. It looks like it is going to be rainy and cold too but, that will not stop us from tracking all around the neighborhood. I am excited that my brothers family and my dad is going to be coming too. 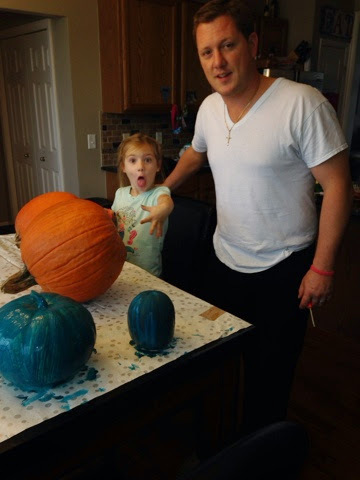 We finally got pumpkins yesterday. We had originally planned on going to the orchard with the kids but, time just got away from us and we didn't make it as a family. So this week while grocery shopping I thought I would just pick up a few pumpkins. Well, you can't wait until the last week I guess because both grocery stores were completely sold out. 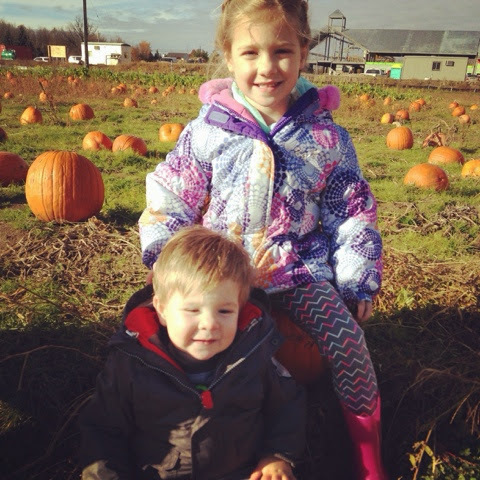 No worries though, I ended up packing up both kids with all our warm clothes on and heading out to a small pumpkin patch by our house. 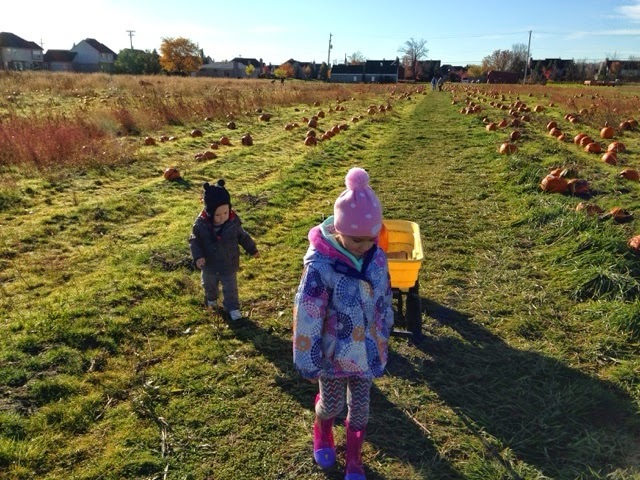 They had a great time walking around and after a long search we finally found 4 pumpkins that were decent. 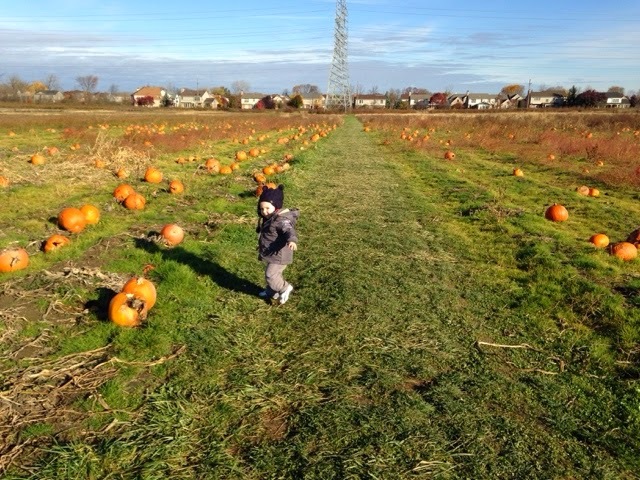 It was like a pumpkin cemetery in that field. 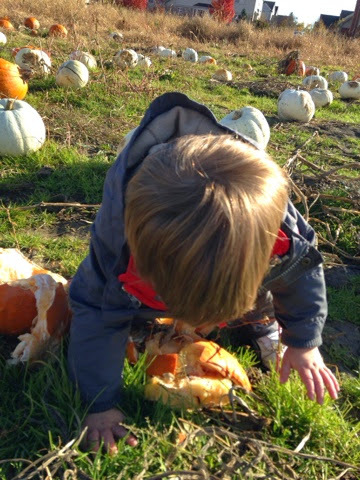 There were so many rotten and bruised pumpkins. 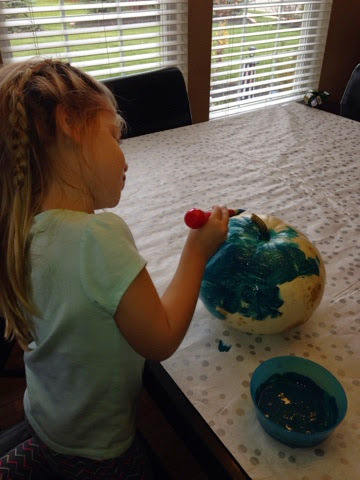 When we got home we painted 2 of the pumpkins Teal so we could join the Teal Pumpkin Project. If you haven't heard about it you can check it out HERE. A friend of mine first told me about it and it sounded like a great idea. We thankfully don't have any allergies in our family but, I love the idea of having a non food option to hand out. We bought glow bracelets and skeleton rings. Hope everyone has a great Halloween. I will post pictures of the kids all dressed up later this weekend. 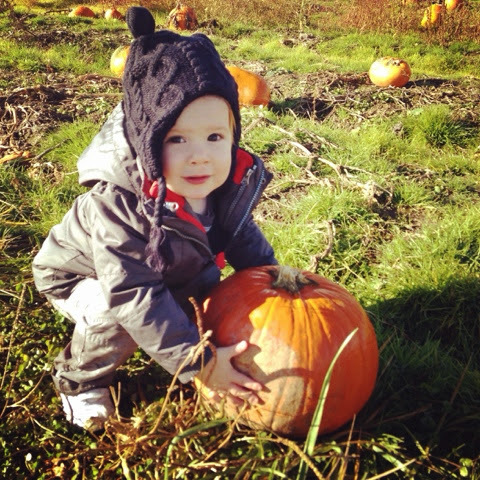 For now here are some pictures of us at the pumpkin patch and of us carving. 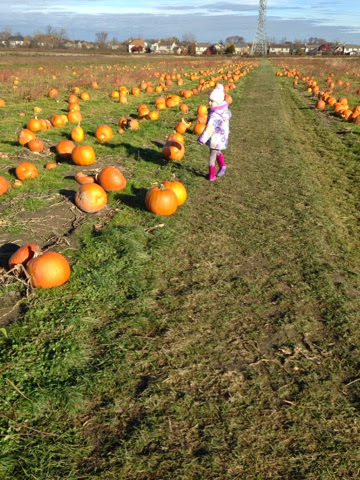 Evelyn ran right out to the field and tried picking them all up. Trying to keep his balance. 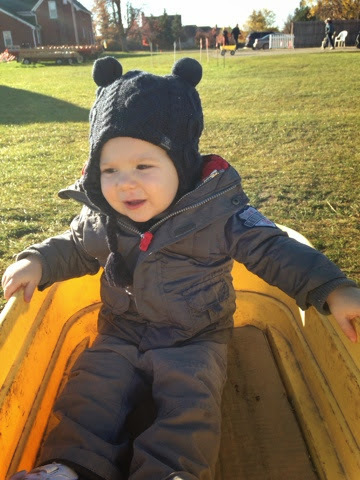 Jack had such a hard time walking around. He must have fell 20 times. This fall occurred on top of a squished pumpkin. He was a wet mess by the time we left. Evelyn always making a funny face. Jack was not into the whole pumpkin carving. 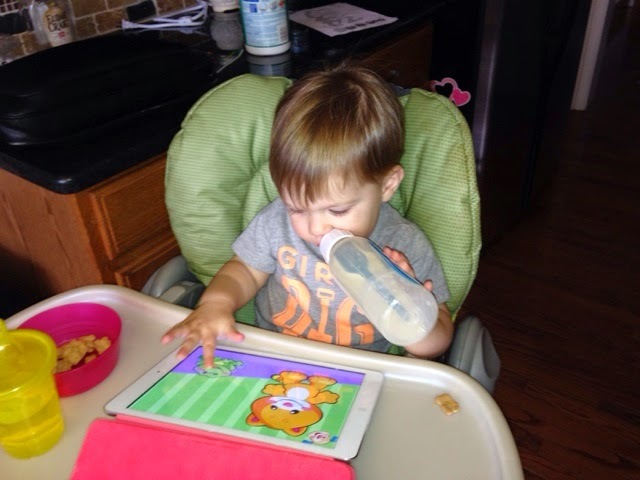 He was quite happy having a snack and playing his game.